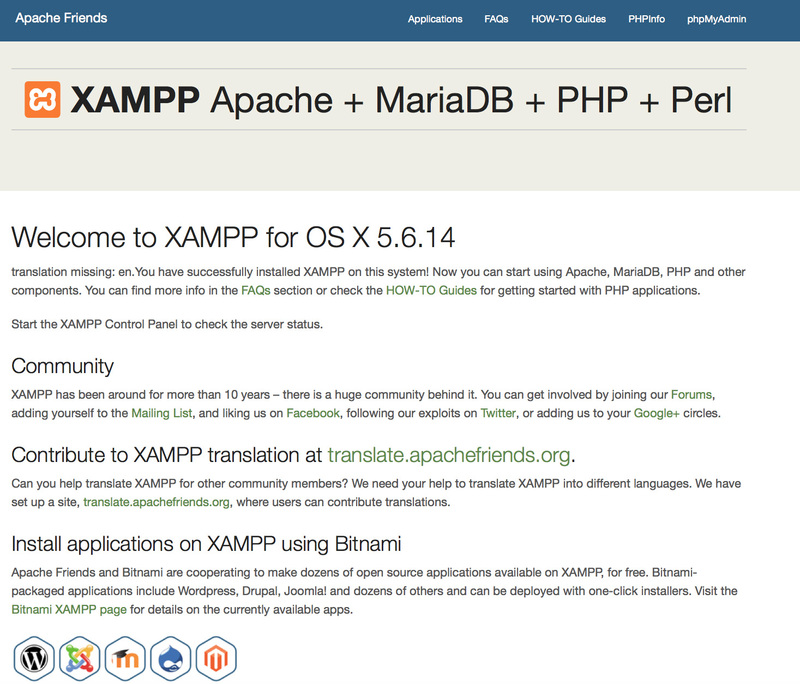 What is the difference between XAMPP for OS X and XAMPP-VM? XAMPP for OS X is a native installer for OS X. It installs Apache, PHP and other XAMPP components directly on your OS X system, in the /Applications/XAMPP folder. XAMPP-VM is a virtual machine for OS X. It includes Apache, PHP and other XAMPP components and runs them in a Linux-based virtual machine on your OS X system. For more information, refer to the blog post at https://www.apachefriends.org/blog/new_xampp_20170628.html. How do I install XAMPP for Mac OS X? Double-click the image to start the installation process. That's all. XAMPP is now installed below the /Applications/XAMPP directory. How do I start XAMPP? To start XAMPP simply open XAMPP Control and start Apache, MySQL and ProFTPD. The name of the XAMPP Control is "manager-osx". How do I stop XAMPP? To stop XAMPP simply open XAMPP Control and stop the servers. The name of the XAMPP Control is "manager-osx". This will launch a small security check to make the XAMPP installation secure. What is the meaning of the error messages I see when starting XAMPP? An Apache daemon is already running. The LAMPP startup script did not start XAMPP-Apache because there is an Apache instance already running. To start XAMPP properly, first you have to stop this daemon. A MySQL daemon is already running. This is mostly due to the same reasons as the above error. The LAMPP startup script found a MySQL daemon already running on your system. To start LAMPP properly, you have to stop this daemon first. Apache doesn't seem to start. What can I do? If you get any error messages visit our community pages for help. How can I make my XAMPP installation more secure? By default, XAMPP has no passwords set and it is not recommended to run XAMPP with this configuration as it is accessible to others. XAMPP: Write the passworde somewhere down to make sure you won't forget it!!! XAMPP: Setting phpMyAdmin's root password to the new one. (1) Setting a password will protect the XAMPP demo pages (http://localhost/xampp/) using this password. The user name is 'lampp'! After running this command, your XAMPP installation should be more secure. How do I activate the OCI8/Oracle extension for PHP? OCI8 add-on activation likely successful. The extension should now be active. Edit the xamppfiles/etc/extra/httpd-xampp.conf file in your XAMPP installation directory. Execute the script by browsing to it using your Web browser. You should see a notification that the message was successfully sent, and the message should be delivered to the recipient email address. How do I backup/restore my XAMPP system? WARNING: The backup and restore functionality is still under development and may not work correctly. The file /Applications/XAMPP/xamppfiles/backup/xampp-backup-22-01-14.sh (in the example above) contains your backup data. Move or copy this file to a safe place. On the new machine you need the same version of XAMPP as on your original/source machine. You may need to restart XAMPP to complete the restore. That's all. Keep in mind that it's a beta feature. Visit our our community pages for additional help.